“Do you want it right or do you want it on time?” Can things be done correctly and on time? When an organization has clarity around its goals and is focused, both quality and time can be attainable deliverables. I know it sounds easier said than done. However, by coaching dozens of executives over the years, I have watched leaders clearly communicate and be focused on their plan and target, which leads to their teams being more focused. When everyone is on the same page, with the same goal in mind, the results are AMAZING! 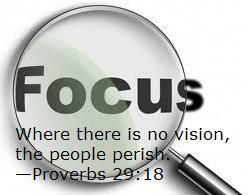 How does a leader focus? Clearly, define your goal. Read this post on gaining clarity for some pointers. Commit to it. Write it down. Brainstorm with those invested in the same goal so the timeline is clear. Share it. These three steps can work for a short project or a long-term, large-scale project. What causes a lack focus? Think of it this way: Monday mornings can be overwhelming for lots of people. Without a plan, most wander. WHAT ACTIVITIES. To help create focus, be clear what activities are needed to reach your weekly goals. DAILY SNAPSHOT: Make a list of everything you do in an hour, a half day, or a full day. WHEN WILL I DO WHAT? You may be surprised how much more you get done and much faster you complete tasks. WHAT”S DISTRACTING YOU? Identify the things that are shiny objects drawing you away from your goals. WHAT ARE YOU AVOIDING? By avoiding the difficult things that need to get done, you may be involved in activities that are drawing you off your focus. SET TIMES FOR ACTIVITIES TO BE DONE. Write down how long you will allow for each activity. Putting yourself on a custom schedule like this can greatly increase your focus. Christy is an seasoned and certified Coach for executives/CXO, leaders, entrepreneurs and top performers with a truly refreshing and unique perspective. Since 2002, she has worked with over 1000 individuals to break through personal and business barriers to perform at their best. She is passionate about learning, challenging the status quo and helping her clients achieve their desired goals. With extensive background in human psychology, personality and strengths, Christy leads each of her clients to better understand themselves, their clients and their team to increase efficiency and productivity. Over the course of her career, Christy has helped her clients customize their approach to implement strategies which maximize personal strengths and styles, and to break through personal barriers and limitations to perform at their highest. With her approach, Christy has helped solopreneurs, business leaders, and CEO’s to grow start-up businesses or expand their organization into multi-million dollar companies. She has helped businesses and non-profits grow, developed leadership teams, and coached CEOs to leverage both their strengths and weaknesses to transform their leadership styles and that of their organizations. Whatever your goal is, Christy expands internal awareness and insight to break through personal barriers guiding individuals to reach new sales, marketing, or team production. Christy brings over 15 years of personal and professional experience to each of her clients. She has developed teams in the corporate world, earned a Master's degree in Psychology, and is certified in the use of the DISC personality system, Guerrilla Marketing approach and Rule the Room Financial system. Founded in her belief each person has God-given strengths and talents, she also works with those in career discovery, transition and advancement to better understand and leverage their gifts and skills to love their work and place in the world. She grew up in California but has lived on the East Coast (North Carolina), and in the Midwest (Minnesota) and now calls Texas (Austin) home with her husband and two children.